The voices in my head are still "huh? ", so I guess is the time for more words: after the huge fiasco Fedora 15 is going to be, we very likely will go downhill, towards extinction and the only way to survive will be to get the hackers back in power. If that will happen, expect them to take no prisoners. Hey! They even have their own song! Yeah, I won't be voting for that one. Wow! my world has collapsed, that was the vote i was counting the most on... now i think i will go in a corner to cry. Fedora oricum n-a fost si nu va fi vreodata o distributie destinata maselor (ca doar din start a fost locul de testare al noutatilor ce urmau a fi integrate in upstream). pe de alta parte, un hacker adevarat alege ceva gen LFS. 15 va fi un esec deoarece Gnome 3 va face "invizibile" restul schimbarilor/noutatilor ... iar 16 va fi probabil un 15 la care schimbarile/noutatile vor fi doar la interfata (in speranta ca asa vor recupera oamenii pierduti). ce uita ei insa e o chestie simpla: asta inseamna 1 an din viata noastra ... si in vremurile tot mai aglomerate din zilele noastre prea putini isi vor mai permite sa piarda un an airea. nu stiu ce voi instala cu urmatoarea ocazie, insa stiu sigur ca nu va mai fi Fedora ... si nici ceva ce-i legat de RH (cu care am inceput, de pe la 2 parca) ... ci, vorba lu' W.Allen, "whatever works". I realize you must have intended this as a joke, but maybe you didn't consider that it sends a message nonetheless? 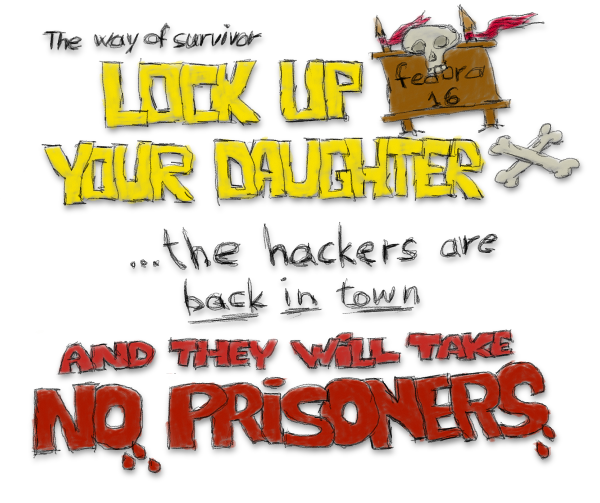 What does your drawing imply that hackers will do to daughters if they aren't locked up? Why can't daughters be hackers themselves?